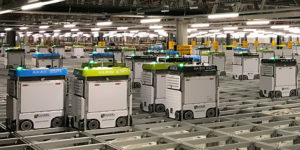 In a trading statement for the 13 weeks to 2nd December, the online retailer said its new robotic fulfilment centres at Andover and Erith were performing well, with Erith now processing over 30,000 orders a week. Retail revenue was up 12 per cent at £390.7 for the 12 week period. Average order size was one per cent down at £104.91. Chief executive Tim Steiner said: “The new capacity that we have brought on stream in CFCs 3 and 4 in Andover and Erith has enabled us to again report double digit growth in new customer acquisition. Both facilities are performing well and Erith continues to ramp up in line with our expectations. “Although in many respects 2018 has been a transformative year for Ocado, the story has only just begun. We look forward to the coming year and continuing to turn our substantial opportunities into sustainable value for all our stakeholders”.